My second Sherlock Holmes/Edward Gorey pastiche, this one is based off of “J is for James who took lye by mistake” from The Gashlycrumb Tinies and BBC’s new Sherlock tv series. Click the image if you’d like to really see the ridiculously obsessive line work — the wallpaper was particularly labor-intensive, and I have no one but myself to blame. I’ve been in a mood lately to do work like this, that involves a lot of tiny pen-and-ink details, and unlike similar attempts when I was younger, I find it rather meditative now. I often put on audio recordings and just sit and let the two things filter into my brain, though there are frequent breaks to IM friends and goof off online, not to mention stretching my back and resting my poor hand. Now that I’ve got the techniques down, I have to figure out what I can do with them that isn’t a parody, pastiche or plain old copy, though. 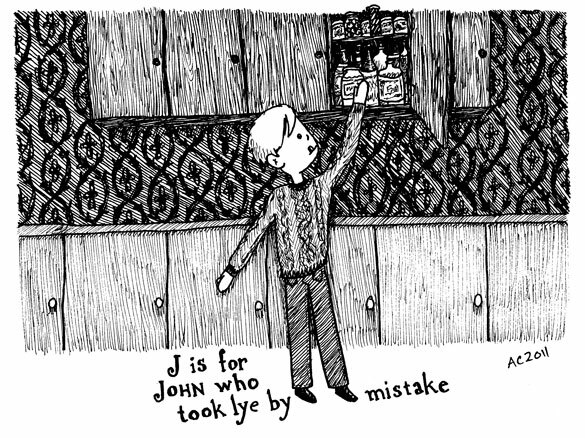 J is for John who took lye by mistake, 8.5″x5″ pen and ink on sketchbook paper, sold. I am so looking forward to having this in my hot little fists.